If Jagex isn’t careful, they’re going to have players throwing tea into Port Sarim. The only guarantees of life in RuneScape are death and, apparently now taxes. 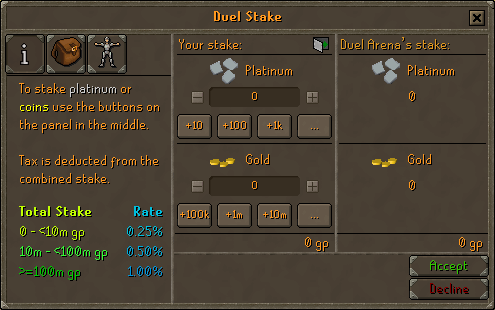 This week’s update to Old School sees the implementation of several changes to combat real money trading, and the main headliner is the inclusion of taxes on duels. Winners will be charged a percentage depending on the size of the stake, ranging from .25% to 1% (see illustration above), and cash bets will need to be within ten thousand gold in value. In addition, it will no longer be possible to stake items. Unlike most of Old School RuneScape’s changes, this update was not polled to players for approval.